Ya' know, sometimes you just can't keep a good thing to yourself! Sometimes the family just has to worm their way in, especially if they think you are having too much fun without them. That's what happened a while back when the family got together and took a little road trip. Now, they know this is Three Friends and a Fork...not Three Friends, a Fork and a Band of Traveling Gypsies, but did that matter? Uh, no! Thus, when the whole family...well, not the whole family, but a good chunk of it...decided to head up to Monteagle, TN, to eat at High Point to celebrate Father's Day...they all joined in to critique the experience. As you can see, it is well after Father's Day, so you can tell, I have put off telling this story. I actually thought the "friends" might make a trip to Highpoint and I would wait and write about the visit by the "professionals", but, no! 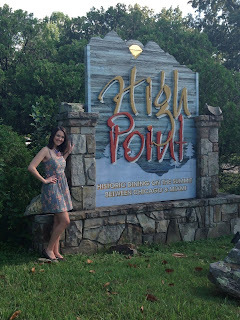 I have decided, in the interest of truth telling and also so you can see just how badly the family is wanting to put their two cents in, to tell you about the family trip to High Point Restaurant. According to the High Point website, the restaurant is located in a 1929 mansion which was supposedly financed by the famous gangster, Al Capone. The old house is three stories which include escape hatches on the roof and underground tunnels in the basement. The floors are said to be filled with sand to make them bullet proof. People around Monteagle tell stories about Capone and John Dillenger hanging around the patio playing cards and enjoying cocktails. The house is situated in the quaint little village of Monteagle. Located in southeast Tennessee, on the Cumberland Plateau, 2000 feet above sea level, Monteagle is the highest point between Chicago and Miami. Just west of Monteagle is The University of the South in Sewanee, TN. It is worth a trip just to see the beautiful campus containing many homes and buildings predating the Civil War. I'm not going to tell you it is an easy drive, but it is definitely picturesque. So, back to High Point. We made reservations and, true to form, were the first to arrive at the restaurant. Those of you who know Sadie know that she is nothing if not punctual in the extreme. As children when my family went to church, we were late if we were not the first ones there to open the doors. For my sisters and me this has been a source of frustration...and rebellion! There was much foot dragging done by us, mostly during our teenage years. We may have won some battles, but we ultimately lost the war, so here we were, opening the doors to High Point Restaurant. 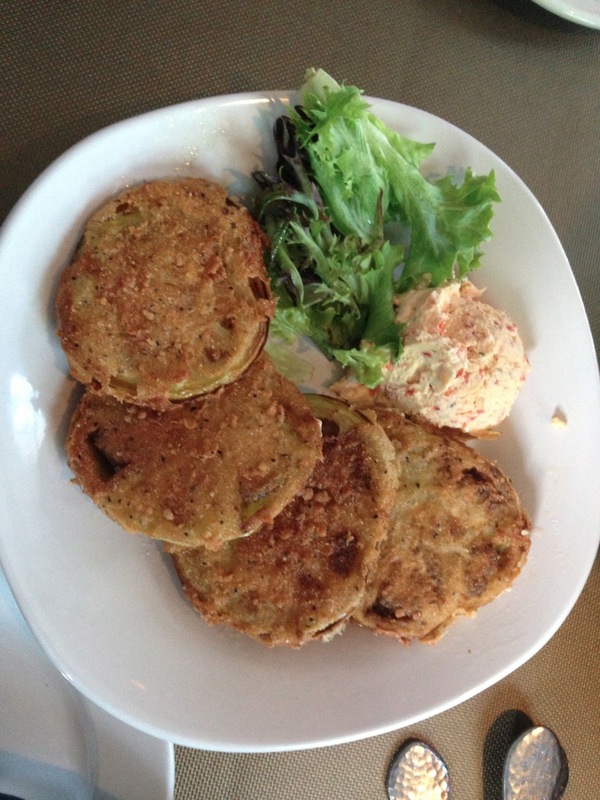 After we were seated and drinks were ordered, we chose a couple of orders of fried green tomatoes as an appetizer. They were delicious, crisp, hot, not greasy at all. 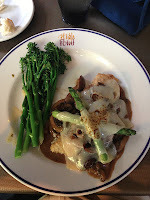 They were served with a peppadew pepper boursin cheese which I loved! The other appetizer we tried was a seared Ahi Tuna with a soy dipping sauce and pickled ginger. It must have been wonderful, because I heard a little arguing over the last piece. The next course was our salads and they were lovely. I had a Blackberry Winter Salad which was a combination of spring mix lettuces, gorgonzola cheese, walnuts and blackberries topped with a blackberry vinaigrette. My sister, Kerri and my niece, Haley, also ordered the Blackberry Winter Salad. 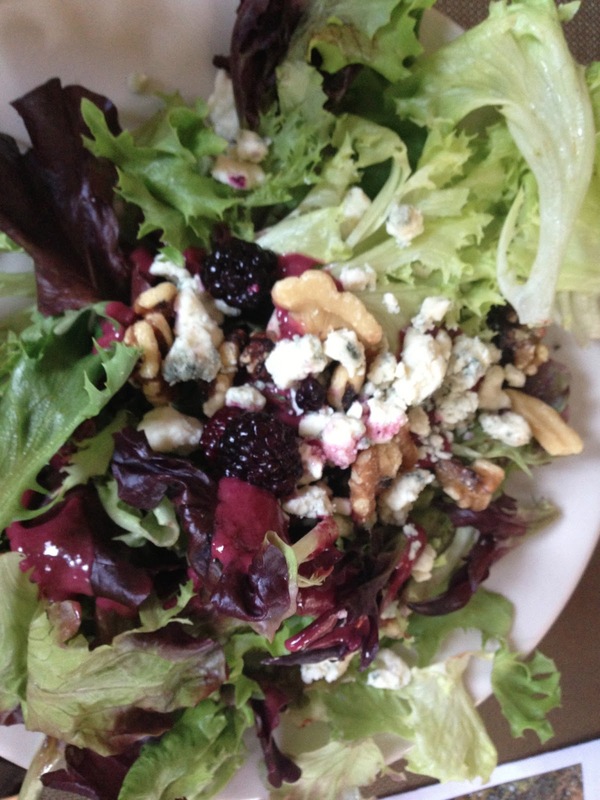 Haley wanted the Blackberry Winter Salad, but only if she could switch out the gorgonzola cheese for goat cheese. I know, I know...the girl is high maintenance! But she is cute and the staff was super accommodating, so Haley was happy. Haley and I loved our salads, but Kerri said the dressing was either missing or so scant on her salad that it was dry. I don't know why she didn't ask them to bring her some more dressing. My son, J.D. ordered the lemon Caesar salad and he loved it. Now he wants a squirt of lemon on every Caesar salad he eats. My younger son, Rob, opted for lobster bisque instead of salad. He ate it all, so it must have been good! A few people had the BLT Bibb salad with applewood bacon, tomato, ranch dressing and gorgonzola cheese. It looked really good and was well received by everyone who had it. Everyone else either had one of the salads already described or a house salad with a country vinaigrette and they all seemed happy with their selections. As you can see, we had quite an assortment of entrees. The only "entree" not shown was Haley's. She only ordered cheese grits and they looked so unappetizing we didn't take a picture of them. You can see the grits on Rob's plate, however. He got them as a side to his bacon-wrapped sea scallops. They were a cold gelatinous glob of stone ground grits with some cold grated cheddar cheese sprinkled on top. They were a total disappointment. Kerri had the same thing, but with marinated grilled shrimp. She did not like her entree anymore than Haley did. Her grits were cold and her shrimp were dry and overcooked. My brother-in-law, Tim got the chicken breast covered in a crimini mushroom Madeira sauce. He said it was just ok and lukewarm. Except for those three, everyone else loved their meal. Those who got steaks and fish all said they were cooked properly. The High Point Oscar with fried heirloom potatoes was especially good. 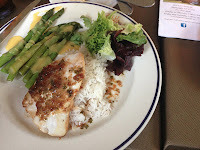 My grilled sea bass had an Asian ginger sauce that I particularly liked. Scott loved his High Point Oscar! 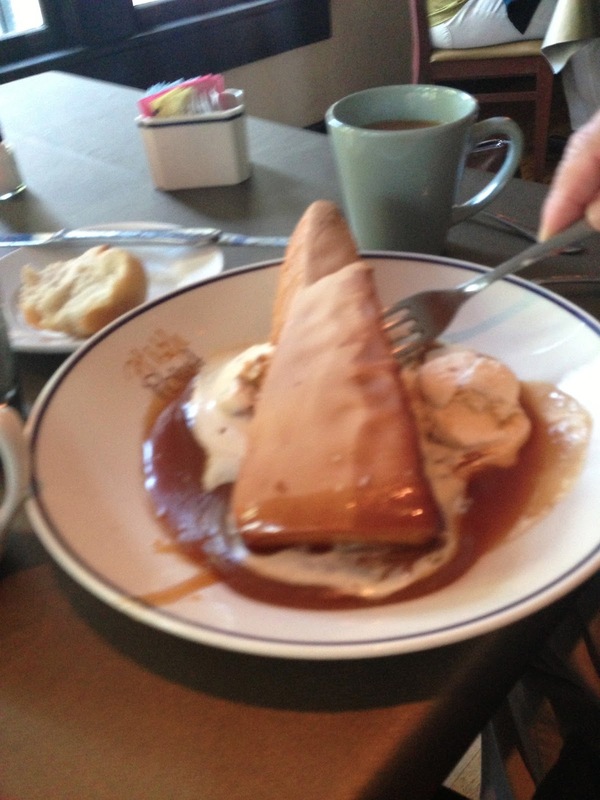 As for desserts, the clear winner was the creme brulee. 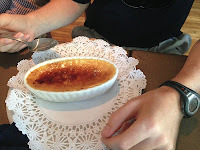 It was thick and creamy with a crunchy brulee topping. The grilled pound cake was good, but it was HUGE! I am not kidding when I say it looked like a whole cake. The Bananas Foster was tasty, but soupy and the chocolate lava cake was dense and dry and almost too chocolatey, to the point of bitter. All thumbs up except for Kerri (thumbs down), Tim (neutral thumb) and Haley (two thumbs down). Scott (taking the picture) also gave High Point Restaurant a thumbs up. All in all, our meal was mostly well received, but for the prices everyone paid for their meal, there should have been no disappointments. We loved the setting and would love to go back, but clearly there are some areas of improvement needed. Those grits should never have been served cold. 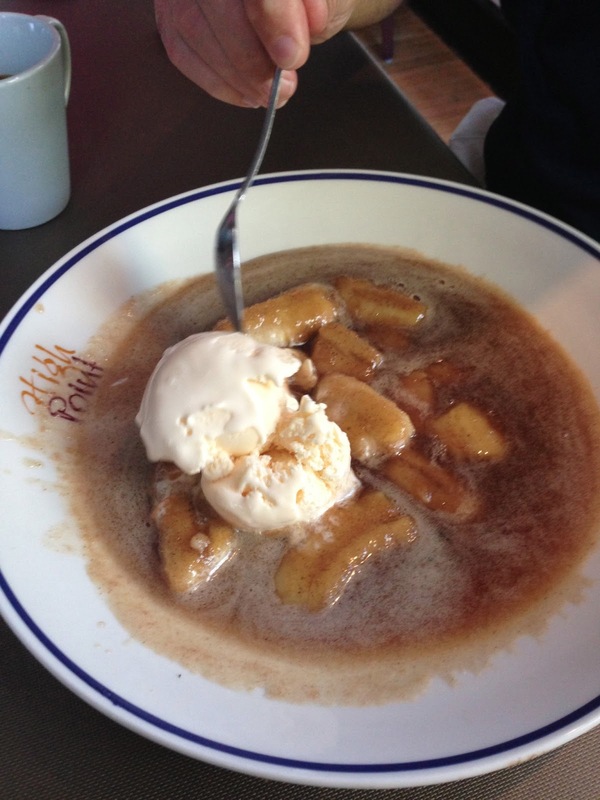 Really, there is nothing worse than cold grits! Haley makes a good model! So, there you have it...not Three Friends and a Fork, but the whole entire family! Sorry, Sherri and Lu...maybe next time!